Ich habe den AussiCannIndex angepasst, da weitere Pot-Stocks in Australien verfügbar sind. 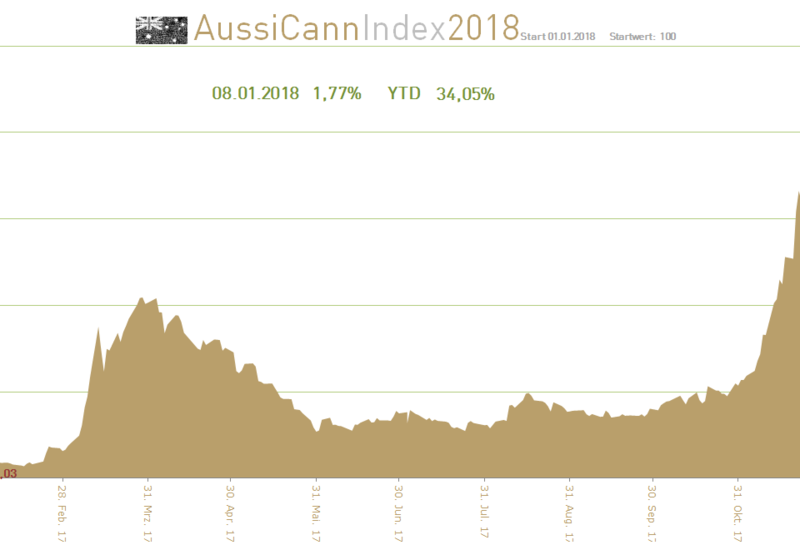 AusCann Australischer LP -completed its first harvest (of more than 300kgs) in Chile in April 2017. The company currently imports cannabis medicines into Australia, which will be used until its own product becomes available. Auscanneven supplies Zelda Therapeutics for clinical trials. BOD Australia Ltd. has completed the design for a Phase I clinical trial of its novel pharmaceutical grade cannabis extract and delivery system.The clinical trial represents a major step forward in Bod’s strategy of leveraging its naturally-sourced medicines and skincare business to build a high-growth medicinal cannabis business. Botanix Pharmaceuticals Ltd. Botanix Pharma are developing next generation therapeutics for the treatment of serious skin diseases. Their mission is to improve the lives of patients battling acne, psoriasis and atopic dermatitis, by providing new treatment options for conditions that currently are inadequately addressed or are treated with therapeutics that are burdened with side effects profiles.Botanix is preparing for the first human trials utilizing synthetic cannabidiol in a proprietary drug delivery system (Permetrex™) for direct skin delivery of the therapy. Cann Group is a grower and licenced producer of marijuana as well as holding two cannabis research permits. Canada’s second-largest listed medicinal marijuana company Aurora Cannabis Inc holds a 19.9% stake in Cann Group. CannPal Therapeutics CannPal was founded by a team of experienced executives to establish a new standard of care in Animal Health by providing veterinarians with regulatory approved, Cannabinoid-based pharmaceuticals. We’ve identified an opportunity to develop first-in-class medicines for cats, dogs and horses, derived from the Cannabis plant, that have already shown safety and efficacy in humans and rodent studies. Creso Pharma has two divisions, with Creso Switzerland focused on development and commercialisation of medicinal cannabis both for humans and animals. The second division, Hemp Industries focuses on cultivating and producing hemp-based health products. Creso should see substantial sales flowing in the next few months with the imminent release of a number of products. Esense–Lab The first plant eSense-Lab is targeting for re-engineering into a ‚virtual plant‘ is cannabis. The benefits of medicinal cannabis are well know. Once the ‚high‘ producing cannaboid element in cannabis is taken out of the equation – we are left with multiple terpenes that can be used both for medicinal purposes and for mass-production of cannabis-based consumer products. Medlab Clinical is a speculative biotechnology company that is starting human trials of different cannabis-based therapies. There’s no certainty that the trials will be successful, but Medlab is focused on other medicines as well as nutraceuticals. So far, that hasn’t lead to profits, with the biotech reporting a $1.8 million loss for the six months to the end of December 2016. MGC Pharmaceuticals produces and distributes medicinal cannabis from a number of sites in Europe, and has a 51% interest in MGC Derma, a cosmetics and dermatological products company. MGC is also conducting clinical trials on a number of cannabis formulations for treatment of diseases such as epilepsy. In the March 2017 quarter, MGC saw $51,000 in sales from customers, which should ramp up over the next quarters. MMJ Phytotech is more a holding company, with a ~60% interest in Canadian corporation Harvest One Cannabis Inc (market cap of ~C$49 million) and its wholly-owned Israeli subsidiary, research and development company Phytotech Therapeutics Ltd. Harvest One is diversified too, with a horticultural arm named United Greeneries and medical business Satipharm AG. Phytotech Therapeutics is conducting medical trials with medicinal cannabis-based therapies. 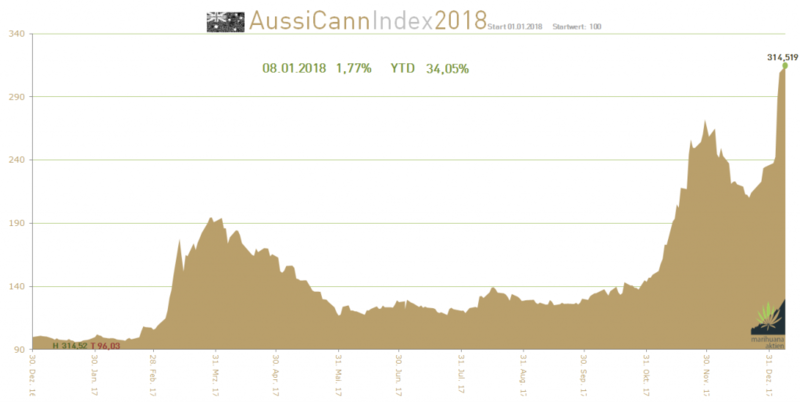 Queensland Bauxite Ltd. through its subsidiary Medical Cannabis Limited (MCL) has received a successful update regarding its winter cannabis crops. This follows on from the early-July update that confirmed successful germination and growth rates of its pioneering winter cannabis crop. There have been very few serious winter trials in Australia and information as to the success of these trials is scarce and uninformative. MCL began a winter growth of cannabis so as to be ready for production as soon as hemp food becomes legal in Australia at the end of this year. Roto–Gro has completed the initial delivery of its order from EuroAg Corporation for the supply of 240 Roto-Gro Units over a 12 month period. The fully-automated Roto-Gro rotary hydroponic system (a method of growing plants without soil) can be used to produce high-quality medical cannabis at a competitive cost. The delivery of the Roto-Gro units to EuroAg is the result of an up-scaled manufacturing schedule. In addition, the company is currently delivering several Roto-Gro units to other customers‘ testing facilities in the emerging medical cannabis and vertical farming markets. Hydroponics Company Ltd is one of the first ASX-listed cannabis companies to have secured a medicinal cannabis research licence. The license was granted to THC’s wholly owned subsidiary Canndeo Ltd by the Office of Drug Control. The research licence will allow Canndeo to build its exclusive Plant Breeders Rights (PBR) protected Cannabis sativa strains. TPI Enterprises mostly produces narcotic raw material (NRM) from poppies but is moving into producing medicinal cannabis. In the 2016 financial year (FY16), TPI produced a loss before tax of $14 million, despite sales of $7.6 million. Those sales are mostly from NRM, not medicinal cannabis. Zelda Therapeutics is focused on developing medicinal cannabis therapies and running clinical trials for insomnia, eczema and autism, as well as several pre-clinical cancer studies. Das Chartbild des Index ist nun weitaus realisitischer als noch mit Stemcell. Die Jahresperformance beläuft sich auf bisher 47,26%.